The heavily-hyped Raw Cuts Remixes arrive with a slight but somewhat inevitable feeling of deflation on first listen. 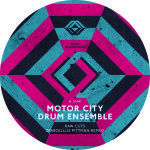 Yes Marcellus Pittman, Mike Huckaby and Recloose (an achingly tasteful lineup) are all remixing Motor City Drum Ensemble – promising everything you ever dreamed of, surely? Certainly, Pittman’s cut is wonderfully organic: flurries of his staple metallic Detroit percussion rattles throughout, like navigating a lush jungle of brittle high hats and chiming cowbells; neatly slotted in-between is the trademark MCDE organ bass and sporadic guitar twangs. The Huckaby and Recloose cuts are a tad more nondescript. The former weaves a choppy rhythm over a bed of soaring strings and hollowed-out drums, an ambitious approach that taps into the jazz indebted soul of Danilo Plessow’s sound. But there’s a little too much going on to really leave a lasting impression. Recloose’s version has been doing the rounds on the internet for a few months now, a straight-up percussive groover – simple but effective drum workout.